Summer time is salad season. All that produce grows in abundance…fresh and local. I’ve always believed that U.S. dairies are missing out on the salad dressing business. In Europe, consumers either make their own dressing—a little vinegar and oil—or buy refrigerated dressings, typically based on yogurt and sold in the dairy case, much like the product pictured. Cup yogurt manufacturers in the States might want to explore savory flavors in a pourable formula. Those processors in the drinkable yogurt category can use the same bottle. 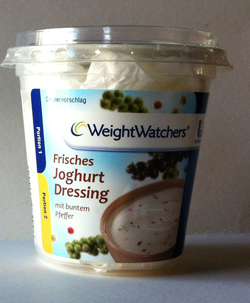 (The Weight Watchers brand is also found on such dressings in Europe.) And, if you are in the recloseable plastic bottle of milk business, especially buttermilk, why not add buttermilk ranch to your line? There’s something very fresh and natural about purchasing buttermilk ranch dressing from the dairy case. Another idea to ponder this holiday weekend: savory yogurt for dipping. I am not talking about the hearty dips based on yogurt sold in the dip case, rather, yogurt with savory seasonings, maybe a little dill, ranch or simply seasoned salt. The idea being simple, and a thinner viscosity than one would expect from a product merchandised in the dip case. In case you missed my BLOG last week about how Greek yogurt is being used in foodservice, you can scroll down and read it. Maybe we can bring this foodservice concept to retail, but simplified, with products that are ready to use. I plan on purchasing some plain yogurt this weekend and experimenting in my kitchen. Maybe your product development lab will want to do the same in the near future. By the way, the Daily Dose of Dairy is taking Monday off to watch baseball, barbecue and dip into homemade savory yogurts. Have a beautiful, safe and dairy-full Memorial Day Holiday! Is Your Yogurt in Foodservice? Your New Competition Is Coming in Strong! Before everything NATO began invading my hometown Chicago, the Windy City hosted the National Restaurant Association (NRA 2012) Show, which this year had a number of exhibitors showcasing innovative new yogurt products. First and foremost, it should be no surprise that Greek yogurt is invading the nation’s menus. In fact, The American Culinary Federation, St. Augustine, FL, distributed reprints of its May 2012 “Ingredient of the Month” feature article, which, you guessed it, focused on Greek yogurt. The handout explains that Greek yogurt can be used in everything from savory sauces to sweet baked goods, and includes recipes, as well as suggestions on how to substitute Greek yogurt for sour cream, cream cheese and butter in various recipes. There are a lot of Greeks in Chicago, which is why the Windy City is home to another purveyor of authentic Greek and specialty Mediterranean foods: Grecian Delight, Elk Grove Village, IL. The company, too, now offers Greek yogurt to its foodservice customers. Grecian Delight’s Chef Michael Zeller suggests replacing sour cream with Greek yogurt. Add a little dill and lemon to create a delightful topping for salmon. Add ranch mix to Greek yogurt and top a baked potato. Great for all dayparts, Zeller says Greek yogurt makes an excellent breakfast parfait when combined with granola and berries. Blend it with honey and maraschino cherry juice to make a delightful fruit dip resulting in a healthy dessert option. Or, use it as a savory sandwich sauce by mixing in basil. On the frozen side, White Plains, NY-based The Dannon Company, one year after acquiring YoCream International, is launching YoCream Greek Frozen Yogurt soft-serve mix. 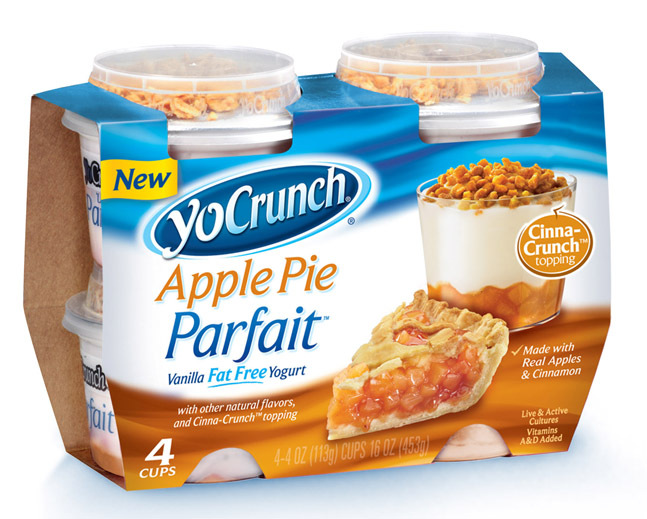 The company is also introducing ready-to-serve yogurt parfaits to simplify foodservice operators’ needs for this in-demand menu item. Speaking of menu items, another local focal—McDonald’s, Oak Brook, IL—is offering fresh blueberries to its customers. The blueberries can be purchased alone, or as a topping on yogurt or oatmeal. 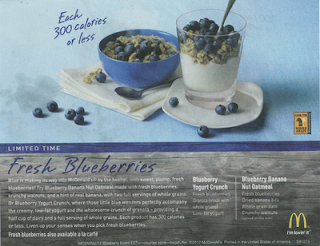 The new Blueberry Yogurt Crunch is creamy, low-fat yogurt topped with fresh blueberries and crunchy granola. The company touts that each parfait, which contains less than 300 calories, provides a half cup of dairy and a full serving of whole grains. I sure hope the NATO visitors get a chance to stop by a local McDonald’s or Greek town! The message was loud and clear at the IDFA 2012 Milk and Cultured Products Symposium in Kansas City: The industry needs to better position dairy products for specific day parts and this can be accomplished through innovative product development and savvy marketing. Orange Mandarin and Oats Low-fat Yogurt was the winning prototype. Developed by Sensient Flavors LLC, the product better positions yogurt as a breakfast food by including a morning favorite: oats. As the heart-health benefits of oats continue to make headlines, now’s the time to make sure the industry shows consumers that dairy and oats are a perfect combination. MilkPEP representatives provided an update on the multi-year, occasion-based marketing strategy introduced this year that is designed to drive the volume and value of fluid milk. The campaign is focusing on two prime usage occasions: Breakfast at Home and post workout: Refuel with Chocolate Milk. During an open discussion, innovators discussed new ways to make dairy part of the nighttime routine. Ideas included promoting milk as the best accompaniment to a warm cookie or slice of pie, to developing a premium “sipping” chocolate milk with added adult-focused flavors. Attendees viewed the entertaining new Milk Mustache commercial for The Breakfast Project, which features Salma Hayek. View it HERE. And this VIDEO sums up how dairy complements every stage of life during all day parts.